Using the Roundhouse .Net Core tool with DotNetCoreTool does not work as it says No executable found matching command "dotnet-roundhouse. This is probably as the Roundhouse .Net Core tool is installed as rh and the alias that is created in the cake folder is rh.ex. The tool should run correctly. Create a new cake project. 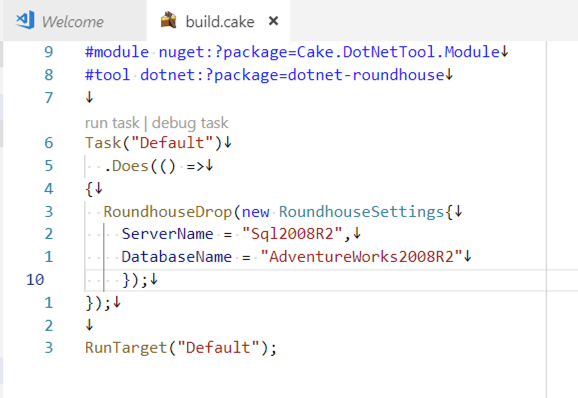 Run DotNetCoreTool("roundhouse"); from any cake task. @Roemer I have just created a PR that should address this for you. I'm fairly unsure if this is the correct way around. and inside is an rh and rh.bat file. Additionally in the <cake folder> is a "shim" called rh.exe. There is no dotnet-roundhouse or dotnet-roundhouse.exe except for in the folder name. Would your fix still fix that issue? @Roemer hmm, I had made an assumption based on the name of the package. Having just attempted the installation of this global tool, I can see that this PR isn't going to work as it currently stands. @Roemer I have updated the PR to include only the shims that are created as part of the dotnet tool installation, i.e. rh.exe and rh. @gep13 Hmm yes it works now. I think I first tried to use the nuget package (tool nuget:?package=roundhouse) which did not work for me because there was a bug in the executable so I tried using the .net core tool (which worked). For some reason I had to add ToolPath = Context.Tools.Resolve("rh.exe") to RoundhouseSettings but now it seems to work correctly. Probably because I now have deinstalled the nuget tool and only installed the .Net Core tool.